UPDATE: Pace admits to audio problems on new Philips Freeview HD set-top boxes, confirms software fix | What Hi-Fi? Philips has confirmed on its website today that it will issue a software update for its Pace-designed HDT8520 Freeview HD set-top box in early August. The file will be made available on the website for an upgrade via USB, and the date of the over-the-air download will be published on the DTG website. More details about the content of the software release will be given on the Philips website soon, the company says. Pace has confirmed that its two new Philips Freeview HD set-top boxes – the DTR5520 and HDT8520 – do not currently output Dolby Digital 5.1 from the digital connection when viewing high-definition broadcasts. The problem came to light after it transpired that the BBC is using the HE-AAC audio codec for multichannel sound on its HD broadcasts, which needs to be transcoded within the box to Dolby Digital 5.1 before being passed on to a home cinema amp. The Philips boxes can't do this. In a statement issued to whathifi.com Pace, which manufactures the boxes, says: "We have been made aware that there is a potential issue with the sound quality on the DTR5520 and HDT8520 boxes. Although the default audio setting is PCM (stereo), which works perfectly, customers may experience problems with sound quality if they change the audio settings to Dolby Digital ouput. "This is due to an issue with the HE-AAC to Dolby Digital transcoding, whereby the boxes are currently not processing DD correctly. We are working to update the software to resolve this issue, as well as provide a number of other upgrades which will enhance users' experience of the products. "As a temporary measure, we advise customers to keep the default PCM audio settings (as specified in the user manual), until the appropriate software is available later this year, probably in September. We apologise for any inconvenience this may have caused." Philips/Pace is not alone in facing this problem. 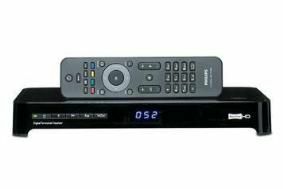 Several manufacturers of Freeview HD TVs and set-top boxes, including Panasonic, Humax and Goodmans, have products on sale that don't handle Dolby Digital 5.1 – as you can read in our special blog. And there have been comprehensive reports on our Forums of multiple problems with the Philips/Pace boxes, as you can read here. Thanks to regular poster professorhat for his research.